After serving as YC’s Jesuit Volunteer from ‘16-‘17, Megan returned to Youth Challenge in the summer of 2018 as the Program and Arts Coordinator. Megan is responsible for facilitating adapted art and recreational activities. 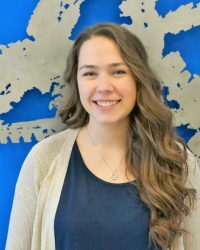 Megan is a 2016 graduate of Canisius College where she received her B.A. in Communication Studies. She has an extensive background in theatre, music, and studio art.